Auto Button, starts the automatic scan of the functions. Rate can be set from 1-9. QUE lights indicate which function is being displayed in the lower display. Gallons per hour can be changed tap Liters or Lbs. 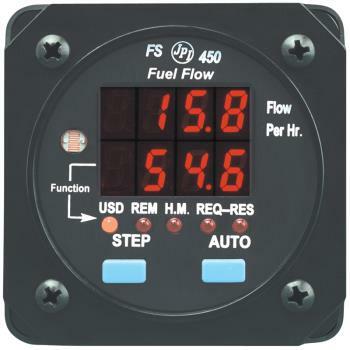 JPI FS-450 can mate to an old Shadin or Hoskins System. Continuous display of fuel burn in Gal./Lbs./Liters per hour. Includes instrument harness and a Flow Scan 201 transducer. Will function with any K factors, connector is pin to pin compatible. Serial port sends and receives data from all GPS units even handhelds.